Last week we had the second fitting on the Gieves & Hawkes travel blazer. Given that I’m a new customer and so we are creating a new pattern, both were basted fittings and the first looked much like this one, just with a poorer fit. At this stage it’s coming along nicely. 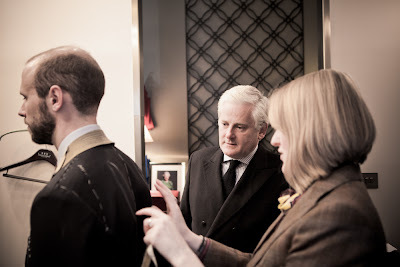 I was interested to see that the shoulder padding was not as great as that in my Huntsman jacket, but was still noticeably more than that employed by the likes of John Kent or Henry Poole – and neither of those is exactly known for soft tailoring. The only points of alteration needed after this second fitting are a little stretching of the cloth across my relatively large shoulder blades, and a picking up of the right side. You can see that that side looks a little less clean than the other, both in the sleeve and forepart. 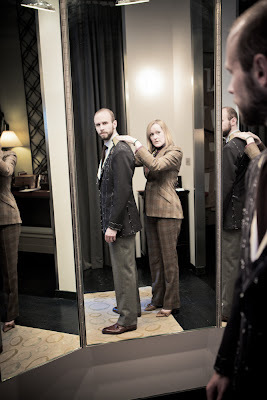 Kathryn suggested narrowing the lapel from 3¼ inches to 3, but I think that would be too contemporary. There are a number of options for the removable buttons and we still haven’t settled on which will work best. 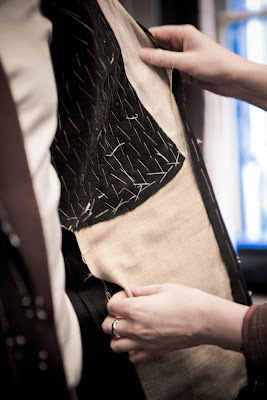 The method often used on white Marcella shirts or waistcoats (where you might want the option of buttons or studs) is to have a hole rather than a slit, poke the metal shank through and secure it with a special pin. The design is much like a hair pin. The alternative on these shirts or waistcoats is to have all the buttons on a placket, which makes them that much harder to lose. This method will be employed on the cuffs of the Travel Blazer, but we’re not sure yet about the fronts. Whatever the fastening mechanism, they will certainly sit in a placket of their own on the inside of the jacket, to avoid catching on the shirt. The button options will be brown horn or brass, the latter engraved with the shield of my Oxford college, Trinity. How the horn buttons, which won’t have a natural shank, will fit into the system is another piece in the puzzle. The fresco trousers felt really lovely. I was surprised they didn’t feel rougher, given how coarse fresco can feel in a bunch, and they are only half lined in the front. We decided the narrow them from 17-inch bottoms, here, to 16s. The fronts will also be picked up slightly to try and give a cleaner finish – though this is always an up-hill struggle without pleats. The next fitting, in two weeks, will be finished bar the buttonholes. Previous post on cutting here. And the original project here. You can follow the discussion on Gieves & Hawkes: The perfect travel blazer 3 by entering your email address in the box below. You will then receive an email every time a new comment is added. These will also contain a link to a page where you can stop the alerts, and remove all of your related data from the site. Very nice! True craftmanship displayed! Simon, as always, great to see you experimenting with various options and lovely to see this latest project come to life. I am curious about the materiel used and because there seem to be some sort of filter applied to these images, I can’t very well tell. Would you be able to post an unprocessed image of the material? Cheers! Yes, Andy does like his filters. I’ll see if I can take one next time I’m in. It is a fairly straightforward navy hopsack. 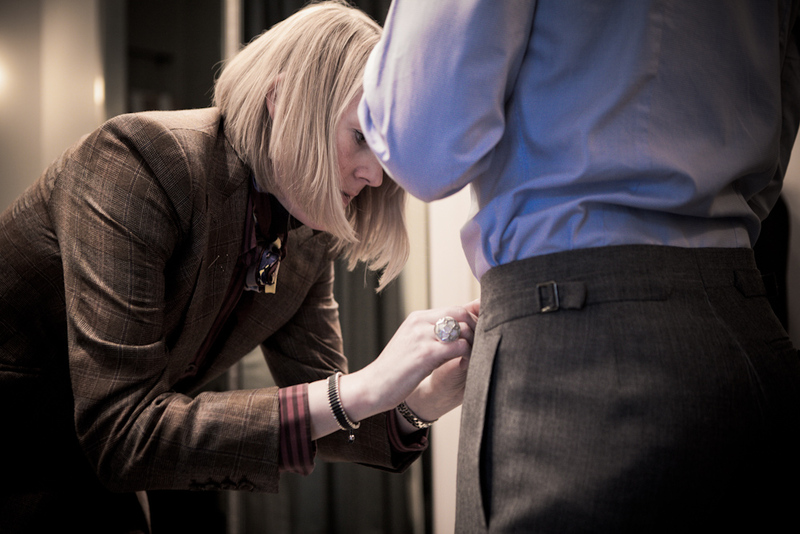 Have you ever considered trousers with a higher rise, ie that sit at the natural waist? As a slim person I think they would work for you. After I tried high rise trouser I found that there is no going back, especially if they have forward pleats and are full at hips (think Sean Connery in Dr No). I have, but I’m afraid I don’t like it, either for style or comfort. In terms of style, I think it only worked on an older generation because they never took their jacket off. I wear a jacket most of the time, but when i have it off I don’t want the proportions to be that out of whack. In terms of comfort, I find it too tight without braces and with braces (so a larger waist) I dislike the braces themselves. The jacket appears to be a half inch too short for your torso- was this by intended? I know this post is an old one – just wanted to add in some comments regarding my experience in G&H. Had my Made-to-measure suit made today. I normally go Bespoke in Huntsman and Richard Anderson but G&H is doing a promotion on MTM suit for £795 – might as well take advantage of this. Good points: Experience wise, pretty good. Extremely friendly staffs. I chose a contemporary navy blue business suit design. I’ve got a small frame- somewhere 36S, sometimes 34. The tailor gave me a “block” suit to try on and he pinned off the excess cloth from there. After pinning, the suit looks pretty sharp. Can’t comment on the fit until I actually try the real thing on. I was surprised that they could now add the option “roped shoulders” on MTM! Everything else is standard operation. 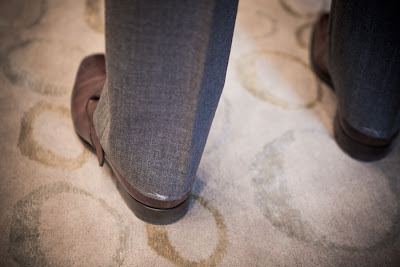 Bad Points: I was always under the impression that MTM suits, especially from Savile Row, are made in England. However, this is not true anymore. The half canvassed M2M I purchased is now made in Mauritius. The company who made them, Wensum from Norwich, was acquired by a Mauritian company – so I heard. Up another level, the full canvassed M2M, is circa 2000GBP and made in Italy. 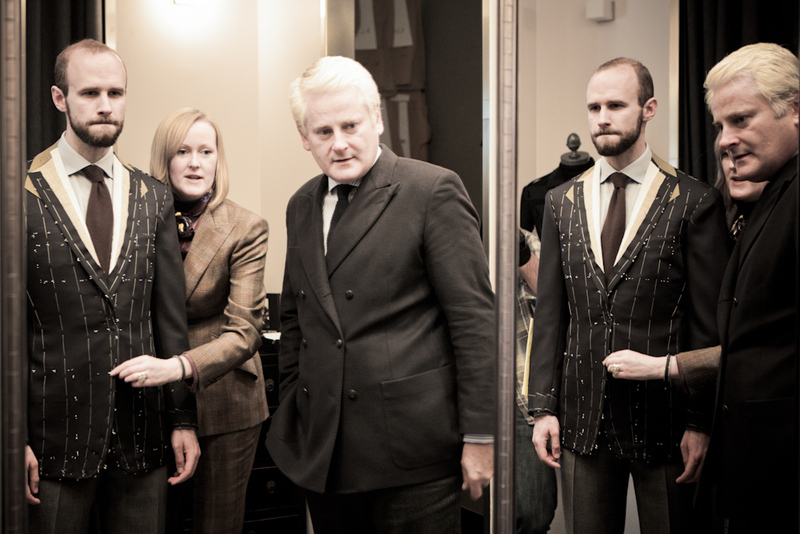 Only the Bespoke is made in Savile Row and the price is now circa 4000GBP. I was a bit disappointed because I came all the way from Singapore and found out that the entire shop (ready to wears) are not British made. Even the neckties are not. Another major disadvantage of going MTM is: you cannot move the side pockets up nor down. And due to this reason alone, I DO NOT recommend anyone to “shorten” the length of the MTM blocks/template suit. The pocket will appear too low, making the suit looking odd. Well, lets see how it turns out in the end! Thank you JChen. I’m afraid it’s been a long time since ready-to-wear clothes like this were all made in the UK. I have always been a fan of your journalism and knowledge of men’s style. I smiled when I read that you attended Trinity, I’m currently sitting in room 13/6 overlooking garden quad and revising for collections. From one Trinitarian to another, keep on representing Trinity in the world of style! Nice room. I missed out on garden quad unfortunately. Two years on staircase six and then Stav. Good years though.